Much to my surprise, shoved in between games like House of the Dead: Overkill, Mad World, and The Conduit, was another Sonic game. I decided to take a (very) quick look at it. 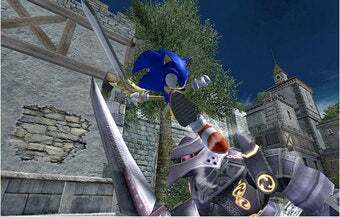 Sonic and the Black Knight is a fast-action Wii game that mixes going really really fast with some action mixed in. It's basically an on-rails shooter where you have to mix acceleration with dodging and attacking. The story picks up after Sonic and the Secret Rings. I played the first level of the game on the show floor of the New York Comic Con. The demo was from the final build and the total time to complete the stage was around 5 minutes. The game is done. Gold, actually, and comes out this March. Difficulty: Maybe I'm just really good at video games, but I never ran into an issue with dying. I don't even think I even played very well. I didn't get a good handle on the controls and was running into almost everything and still managed to take out the end boss without dying once. Stage variety: There's 13 cities, each with three or four levels. Will they play differently? There will be new obstacles to dodge, such as spikes, shooting lava, and rocks, but what else? Sense of Speed: Sonic goes really fast in this game, and luckily so does everything else. The framerate is quick and up to snuff. Controls: There's not a ton of waggle movement going on here. A simple swipe slashes your sword to thwart upcoming traffic. Since it's mostly on rails, you only really need to hold up. Very simple. I obviously would have loved to play this more. The demos they were running didn't last very long. It's clear from not only playing this, but talking to the Sega people as well that this game, and series, is for a different, younger generation of Sonic fans.